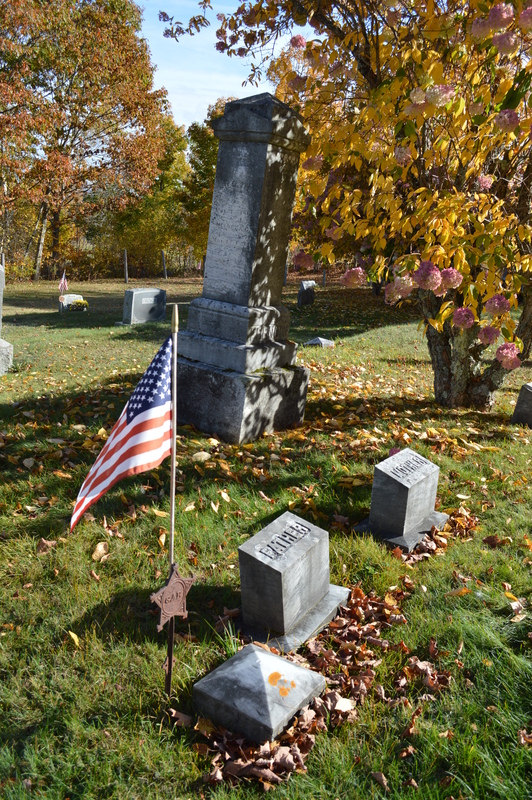 Civil War soldier Joseph B. French died Dec. 7, 1928 and was buried the North Fayette Cemetery. A flag marks his grave site. The grey, weathered obelisk was guarded by a huge hydrangea. Yellow and pink. The plant stood 10 feet tall and bobbed in a gentle wind. It made the place feel alive. When you’re chasing history, that feeling is something special, like finding the key to a secret room inside an old house. “Do you feel like you know him a little better now?” asked Stewart. His wife Lynda stood next to me. It was last resting place of Civil War soldier Joseph B. French. A farmer’s son. Annie’s sweetheart. A private in the Union Army who witnessed American history from behind a cannon. And lived to Tweet about it. The French burial pl0t is located in the tiny North Fayette Cemetery on the border of Fayette and South Chesterville, Maine. 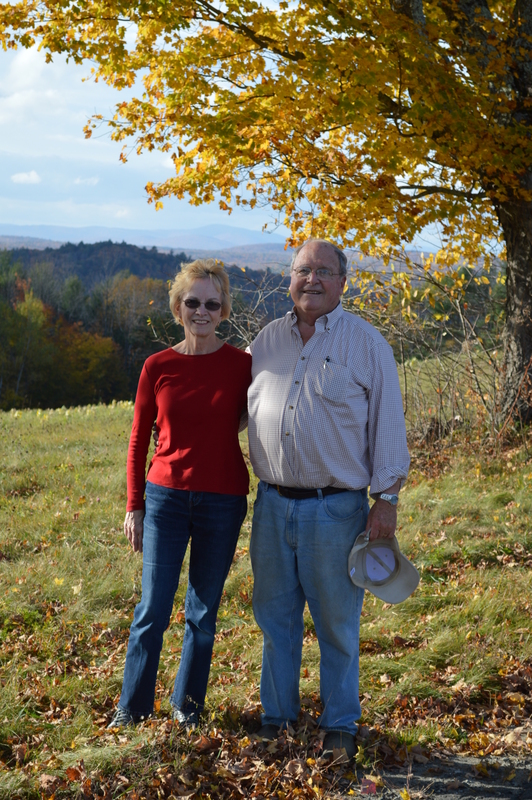 It’s in the rural foothills of the White Mountains. Joseph grew up on a South Chesterville farm just down the road. Dirt then. When he was 22 years old he enlisted in the Union Army and went off to fight “Johnny Reb” for the next three years. I know because I’m transcribing his war diary for the Bangor Museum and History Center. I also created a Twitter account for Pvt. French where he shares his battle stories with the rest of the world. He now has 250 followers. Earlier this fall, I presented my Pvt. French Twitter project to a small group of history buffs at a Bangor Museum Brown Bag lunch. Stewart and Lynda attended. They were very interested in the project. Stewart grew up on the French farm. His father took over the place at the request of Joseph’s aging son Henry back in the 1950s. I immediately asked Stewart if he would take me to the farm. It was a place I thought about as I deciphered daily entries from the 150 year old diary. What did the farm back home really look like? Where is Joseph French now? A well-kept church sits across the road from the cemetery. Its only sign read: Sunday morning service 9:00 a.m.
A few weeks later we where on our way. We drove a little further on narrow roads that were cracked and grey like elephant skin. We passed houses, barns and trailers – some empty, some occupied. We stopped at a well-kept church with no name. Its only sign read: Sunday morning service 9:00 a.m.
Across the street was the cemetery. The three of us shimmied through a delapitated iron gate, more of a cow fence really, and walked under two maple trees. There were maybe 100 headstones. Just eight U.S. flags. Joseph B. French was right in the middle. Next to him was Annie. Henry and his sister Melvena were on the end. 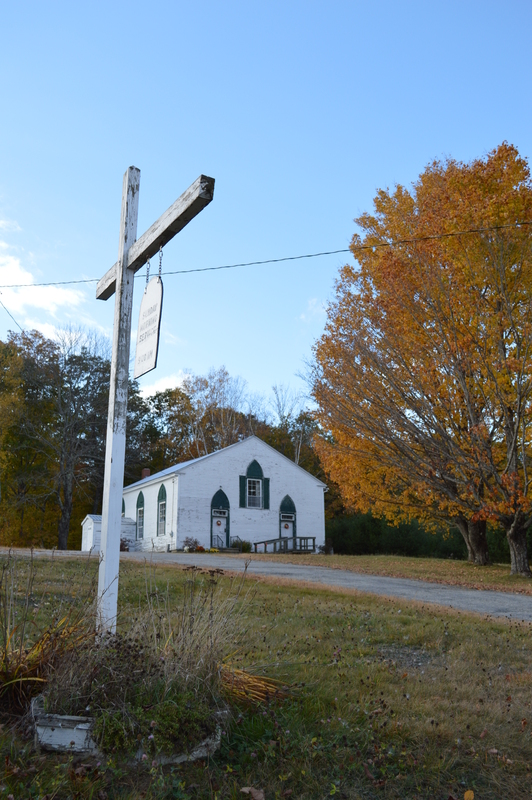 I took some pictures and we talked about the French family, the cemetery and what it must have been like to live and die in rural Maine all those years ago. We climbed back into Stew and Lynda’s hybrid car and drove a short distance up North Road. The old French homestead was destroyed by fire back in 1930 but it really didn’t matter. What mattered was the place. The rolling hills. The small open fields, cleared by hand in 19th Century. The giant trees that lined the road and framed amazing views into the valley. Mountains off in the distance as far as you can see. This where Pvt. French grew up. It’s where he lived his life after the war and it’s where his spirit remains alive. Lynda and Stewart drove me out to the old French Farm in S. Chesterville where I took this picture. Stewart grew up on the farm back in the 1950s and 60s. How fulfilling it must have been for you in telling the Private’s story – to visit the French homestead to see where he lived, walk where he walked and visit his final resting place. Hello to all. I own a recruiting poster from 1861 with Joseph p French recruiting officer. It is in frail condition. I did not know anything about his story. Thank you for all the time you put transcribing this story! He was my 3rd Great-grandfather. My Great-grandmother Olive lived until she was 99 and she would tell stories of how he would teach her military songs. She mentioned how much she liked him. I am not aware (while she was living) that she was knew of the diaries. My family and I recently took a trip to Canada and on the way stopped at Bangor Historical Society. Hello Lois Lax – Would it be possible to see a picture of the recruiting poster? Thank you!